What’s the recipe for happier cities? When we ask this question of friends who design and plan cities, they are unfailingly generous with their opinions. Some architects answer that it’s all about aesthetics. Some traffic engineers say it’s about level of service — that is, how efficiently they can move cars around. Landscape architects wax poetically about nature. And when they all start to argue and throw things at each other, we ask them to take a deep breath, press pause, and start the conversation again. Because the first step in planning a happier city has nothing to do with design. It has nothing to do with buildings or roads or trees or bicycles. The first step is to agree on what matters for wellbeing. First we need to figure out what we want to achieve, then we’ll be ready to look at the evidence that links design and systems to human emotions, behaviour and health. 1) Subjective wellbeing: This the sum of people’s assessments about their own state of happiness, either in any particular moment, or with their lives. Happiness economists like this measure, because they can use it in surveys of hundreds of thousands of people, and correlate the results to societal and environmental conditions. 2) Psychological wellbeing: This describes the degree to which people are living their full potential, using their skills and feeling as though they are succeeding. The psychologist Carol Ryff uses the term “challenged thriving” to describe the ideal state. It’s not the same as feeling cheery or content, but it is associated with good health and productivity. 3) Healthy life years: Most people say they want to enjoy a long life. But a longer life is obviously happier if we enjoy good mental and physical health until our dying day. It turns out that healthy life expectancy is a strong predictor of happiness among nations. There’s no substitute for meeting people’s basic need for food, water, shelter, sanitation, and safety. Recently, we surveyed residents in Mexico City to learn what they wanted from their parks. We found their desire for safety crowded out all other goals. But when working to meet basic needs, we can also address other areas of wellbeing. For example, the most dangerous thing about a day at the park in Mexico City is crossing the killer avenues around the city’s parks. By making those roads safer and slower, the city can also nurture healthier behaviour such as walking and cycling. After core needs are met, social relationships are the most powerful driver of health and wellbeing — in cities and across nations. While the pleasure we experience after buying a new car or house wears off quickly, the satisfaction that comes with social bonds is long-lasting. People with strong, positive relationships are happier. They are healthier. They are more productive at work. They live, on average, 15 years longer than people who are socially isolated. The power of social trust goes beyond relationships with family and close friends: Even superficial encounters in public raise people’s spirits as much as time with close friends. We’re talking about making eye contact with passersby, saying hello to a neighbour, chatting up with the local butcher or having the barista at the local coffee shop know you by name. These seemingly shallow encounters are actually correlated with economic growth, creativity and happiness. Unfortunately, loneliness and social disconnection is reaching epidemic levelsin many countries. It’s not obvious to many that the solution to isolation is in the physical design of our communities. But the evidence shows that it’s critical. Designing streets, public spaces and housing for sociability can help us all reconnect. Physical health is an essential element of human wellbeing. Interestingly, people’s assessments of their own health are a better predictor of life satisfaction than their doctor’s objective assessment of their actual physical health. In other words, feeling healthy is just as important to happiness as actually being healthy. Urban design directly influences people’s health outcomes and feelings by mediating our exposure to risks, pollutants, and physical danger. But it also leads us to sickness or health by nudging us towards more active or passive forms of mobility, and by mediating the frequency and quality of our social interactions. Unfortunately, many community designs these days make unhealthy behaviours — sedentary lifestyles, eating unhealthy foods, and spending time alone — the default. Better design helps shift people back to healthier lifestyles, preventing many of today’s leading causes of illness and death, including diabetes, stroke, heart attack, kidney disease, and many cancers. Healthier behaviour is also happier behaviour. Surveys show that people who commute by foot and bicycle experience more joy and less sadness, fear and rage than car drivers. Equity and social inclusion matter for societal wellbeing. The more that all people are empowered to participate in economic and cultural life, the stronger we all are. Studies have found that societies with a narrow gap between rich and poor are both happier and healthier than less equal societies. So while the push for more equity in cities has an ethical basis, it also has pragmatic benefits for people of all social classes. It’s also important to recognize that status differences have a powerful psychological effect. High-status individuals are healthier and live longer than those with low status, even when they receive the same healthcare. Just look at South Korea, a wealthy and advanced nation, whose youth are amongst the unhappiest in the world — primarily due to income inequality and societal pressure to succeed. Hypertension, high cholesterol and more frequent sickness all accompany low status. Being low in status is like standing in a shower of stress hormones every day. While cities may not be able to completely cure all societal inequality, the way we design and manage urban places is central to any effort to reduce poverty and include everyone in the social and economic life of the city. People who feel able to navigate and thrive amid daily challenges are happierand more resistant to disease. They live longer. They’re more productive. They feel good. This is the condition that psychologists call mastery. Some people are simply more inclined to this healthy state. But urban design, places and systems can enhance or corrode this ability to cope with everyday challenges — commuting, wayfinding, socializing, or working — by making them easier or more difficult. Anyone who gets stuck driving in brutal traffic (a situation that produces a similar stress response as flying a fighter jet in combat) knows this all too well. Well-designed places offer people a sense of ease and freedom. Rather than making us feel stuck or frustrated, they empower us to move as we please. Smart design meets our basic needs for comfort, so we’re not stressed and uncertain about our immediate future. Most of all it prioritizes efficient forms of transportation, which brings benefits — more time, less aggravation — to everyone. City spaces and systems have a clear and immediate influence on how we feel every day. They deliver pleasure and pain, and produce wellbeing effects that last far beyond the moment. Most people’s happiness is determined not just by what they’re experiencing in the present, but by memories of previous good and bad experiences. Just think of a painful visit to the dentist, and ask yourself how badly you want to go back. Positive memories are the basis of feeling attached to a place. They induce people to return for work, shopping and play, and they boost economic activity and social connections. So efforts to nurture joy and contentment in our urban experiences and weed out pain and frustration, are not superficial. They’re crucial for the success of great neighbourhoods and cities. Psychological wellbeing is about much more than contentment or pleasure. It involves feeling that our lives matter, that what we do has meaning, and that we have the ability to change our world. It also encompasses the belief that our relationships with other people are positive and impactful. People who feel a sense of meaning and belonging in their life are healthier, more productive and live longer. Most commonly, meaningfulness comes through our relationship with other people and the places we care about. Folks who work together in community gardens, for example, report feeling a deeper sense of care for their community. And that feeling, say psychologists, contributes to greater social trust and happiness. By nurturing a deeper sense of meaning and belonging, we also create a greater sense of loyalty and attachment to employers and local businesses. Often that means giving more people a role in helping shape the design and the life of their communities. Resilient people have the resources, knowledge, flexibility, and wherewithal to maintain their wellbeing despite disruptions to everyday life. Resilient places need to do the same. Our cities are prime consumers of scarce resources and prime emitters of the greenhouse gases that are responsible for rapid climate change. On the other hand, cities and their residents are expected to experience the searing impacts of climate change, from killer heat waves and ravaging storms to migration and economic shocks. Resilient systems help communities to adapt, respond, recover, and thrive in the face of social, economic, and environmental change. That might mean better stormwater management, or local food systems. But in an interconnected world, authentic resilience means considering the wellbeing of all people affected by our actions. The carbon that we burn living in North American sprawl contributes to flooding in coastal lowlands today, and in the future. This needs to be part of our resilience calculus. In a world where people feel increasingly disconnected from one another, we need to use all the tools at our disposal to create communities worth caring about. The good news is that in an interconnected world, actions to boost urban happiness are also actions for sustainability, equity and resilience. 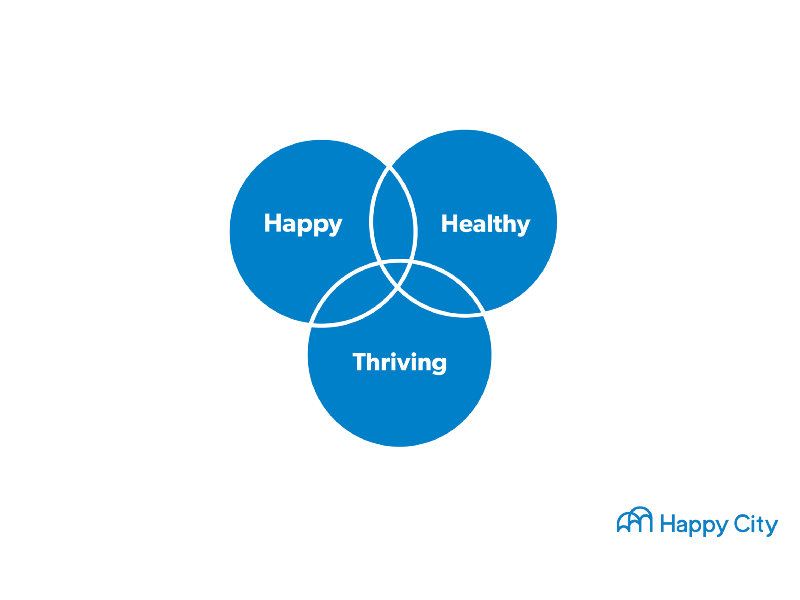 In later articles, members of our team are going to break down these nine elements of urban wellbeing, and demonstrate how to use design, systems and relationships to maximize health, happiness and inclusion.